In the Federal Reserve’s stress tests, Santander is lucky that it isn’t out after three strikes. The Spanish bank’s U.S. unit embarrassingly failed the annual exam on process grounds for the third time, and Deutsche Bank flunked for the second year. The broader warning from Wednesday’s results is clear. More of Europe’s banks will have to take the exams in the future, and unlike North American counterparts they seem to find it as hard to grasp as, say, baseball. Deutsche had looked closer to passing this year, but the German lender and its Spanish counterpart were both found to have serious deficiencies that “critically undermine” their capital-planning processes. The firms weren’t able to adequately explain risk management and controls. Like the other 31 mostly U.S. banks with assets greater than $50 billion stress-tested by the Fed, however, they met quantitative capital standards in a severe downside scenario. Morgan Stanley managed only a qualified pass – it has to resubmit its plan to address some less fundamental process shortcomings. As long as the Wall Street firm does that, only Deutsche and Santander will be prevented from making capital payouts. That means their parent companies won’t see any cash. Other European lenders may be looking on a bit nervously. The biggest overseas banks have to reorganize themselves as holding companies in the United States by Friday. The new, larger American entities of Deutsche and Santander, along with Barclays, Credit Suisse and UBS, will submit capital plans next year in a pilot exam. Then in 2018, they will be formally part of the stress-test process. The Fed’s idea is to ensure these units can weather a crisis on their own without help from U.S. taxpayers. It can take a few tries before getting the hang of it. Citigroup failed twice before passing in 2015. Deutsche and Santander are learning, and may be focused on getting their new holding companies through rather than the current structures. But repeat failures show it isn’t easy to master the Fed’s test, which the central bank intentionally toughens each year. The two European banks look to be having the most trouble. Maybe they and their rivals need to warm up more intensively for this particular unfamiliar sport. 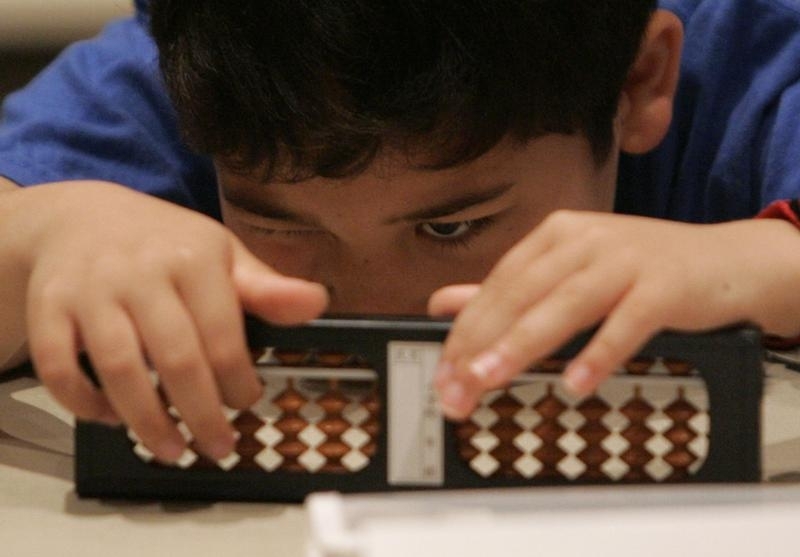 An elementary schoolboy looks at a traditional Japanese calculating tool called the soroban (abacus) during the 26th American school soroban contest in Tokyo May 22, 2008. Deutsche Bank and Santander failed to pass the second round of the 2016 bank stress tests, released by the U.S. Federal Reserve on June 29. This is the second failure for the German lender's U.S. unit, Deutsche Bank Trust Corp, and the third for the Spanish bank's subsidiary, Santander Holdings USA. They passed the tests on quantitative metrics but did not clear the qualitative assessment. The Fed said they still had "broad and substantial" weaknesses in capital-planning processes and had made insufficient progress rectifying problems. The Fed did not object to Morgan Stanley's capital plan but required the bank to submit a new proposal by Dec. 29 to address certain weaknesses in its capital planning. The other 30 banks were cleared by the regulator, which allows them to make shareholder payouts. Thirty-three financial institutions with at least $50 billion in assets participated in the exams that show how those firms would fare in an economic downturn. The severely adverse scenario included a 7.5 percent collapse in real GDP, a sharp increase in the unemployment rate to 10 percent from 5 percent, and negative interest rates for short-term Treasury notes. On June 23, the Fed found that all of the firms met the minimum capital and leverage requirements even in the worst-case scenario.